The 6003 is a solid system with a 1200W 3-stage turbine. The 6003 provides the perfect solution for thin-to-medium coatings and occasional use. The Pro-8™ gun in either Gravity or Pressure-fed formats, weighs only 1.1 kg and delivers the smoothest finish of its class. 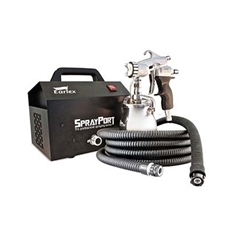 In addition, it is the first HVLP spray gun to offer a 'Wide Spray' feature allowing you to spray up to a 30% wider spray pattern than with the standard air cap. The new HyperFlex™ hose is the newest, most lightweight and flexible hose on the market. The hose has always been the last thing to be developed by manufacturers, but it was something Earlex felt was critical to user interface and performance. It’s so flexible that it allows the user to manipulate the gun in many angles without the hassle and weight of moving a heavy thick hose. It's crush-resistant, sufficient to withstand someone inadvertently standing on the hose.